I am pleased to post the following announcement, sent to me by Greg Routt and Lily Anderson. Adolescent Violence in the Home examines a form of violence that has a profound impact on families but is often overlooked and frequently misunderstood: teen aggression and violence toward members of their family—especially parents. Adolescent Violence in the Home uses a restorative framework, developed by the authors and in use in court systems and organizations around the world, to situate violent behaviors in the context of power and the inter generational cycle of violence. 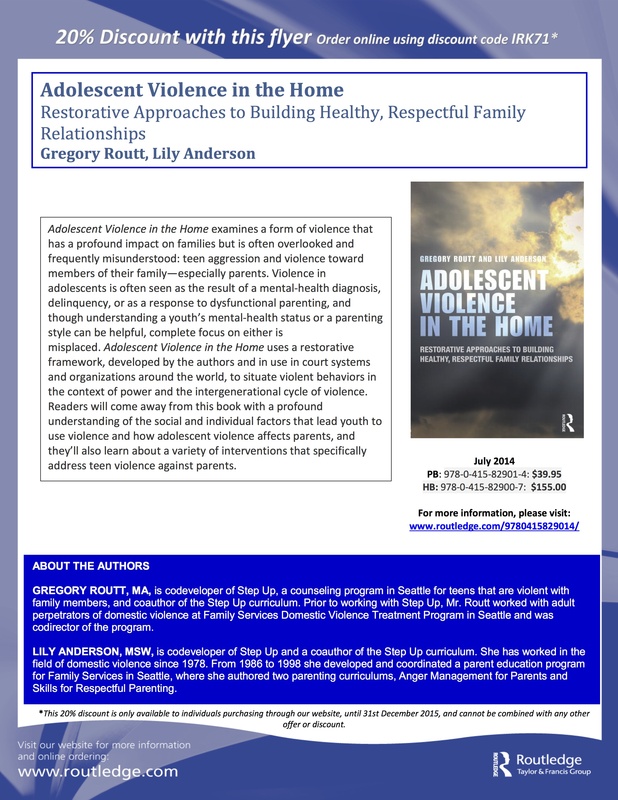 Readers will come away from this book with a profound understanding of the social and individual factors that lead youth to use violence and how adolescent violence affects parents, and they’ll also learn about a variety of interventions that specifically address teen violence against parents. “Adolescent Violence in the Home provides a compelling and comprehensive overview of the challenges inherent in addressing abuse by youth. Based on decades of hands-on, extraordinary work, Routt and Anderson offer specific intervention models proven to be highly effective. This enormously rich book will guide families and practitioners who seek to understand and help troubled, violent youth.” —Sarah Buel, clinical professor of law at Arizona State University’s Sandra Day O’Connor College of Law and domestic violence survivor. —Rachel Condry, associate professor of criminology at the University of Oxford. Buy the book with a 20% discount using the voucher code on this flyer. Thanks for including the flyer Helen, looking forward very much to receiving my copy!